JEJU ---- Under the mist hovering over the Navy base on Jeju Island on Tuesday, South Korea’s newest landing ship, the Ilchulbong, cruises along the coastline waiting for a signal from the deck. Alongside it are its sister ship, the Cheonjabong, and a bigger version called the Dokdo. With the buzzing sound of anti-submarine helicopters and patrol aircraft, the 7,600-ton Aegis destroyer the Yulgok Yi I leads a fleet of combat destroyers. Those onboard salute the three landing ships packed with Jeju residents, military officers and journalists who return the respect. The maneuver was part of a maritime inspection rehearsal ahead of Thursday’s Jeju International Fleet Review. The first such event to be convened in 10 years, it will involve 43 vessels representing 12 countries. While the US is sending its nuclear-powered aircraft carrier the USS Ronald Reagan, the Navy said no Japanese or Chinese warships will take part. Japan withdrew its participation amid a diplomatic row over its controversial military flag, but China has yet to specify a reason for canceling. “Achieving world peace and harmonious civilian-military relationships is why we chose Jeju as the venue for the International Fleet Review,” said Rear Adm. Shin Jang Iy, who is supervising preparations for the festival. The term “maritime powerhouse” is a buzzword used by the Moon Jae-in administration, which advocates an expanded role for the Navy amid increasing rivalry over territorial claims with neighboring countries. While South Korea is surrounded on three sides by the sea, the Navy’s mission mostly involves patrolling the de facto maritime border area in the West Sea, previously the scene of bloody skirmishes with North Korea, including a suspected torpedo attack against a South Korean corvette in 2010. Boosted by the inter-Korean detente and the arms control measures that followed, however, the Navy is seeking to shift its focus to a broader mission of assuming a more assertive role in the region. “Our Navy has been so preoccupied with North Korea over the past decades. Even the Navy units in the rear area were often mobilized to the front line for patrol missions,” said a Navy captain, who helped arrange the festival with Rear Adm. Shin. “Faced with mounting challenges from the region’s waters, the Navy should play a more active role than before. It is not that we have changed our mission; it is more about going back to our original mission,” the captain added, requesting anonymity, citing military regulations. South Korea faces increasing challenges from neighboring countries. In addition to the ongoing dispute with Japan over Dokdo, China has become more assertive about its claim over the international waters between South Korea’s West Sea and the South China Sea. According to the Navy reports submitted to Rep. Lee Jong-myeong of the Liberty Korea Party in September, China has placed eight buoys near Ieodo, the submerged rocks in those international waters, a measure that the Navy sees as an attempt to intensify China’s claims over Ieodo. The Chinese Defense Ministry also expressed anger last month after a South Korean was reported to have sailed close to the disputed islands and entered what Beijing sees as its territorial waters without its permission. Tuesday’s rehearsal was about demonstrating South Korea’s advanced maritime capabilities amid the escalating regional challenges. Nineteen advanced vessels participated in the event along with fighter jets and Special Forces units. Showcasing their maneuverability were the 7,600-ton Yulgok Yi I Aegis destroyer, two submarines, domestically built destroyers and modified combat vessels, including the 4,400-ton destroyer the Daejoyoung and the 3,200-ton destroyer the Gwanggaeto the Great. The Navy also demonstrated how it would respond to a submarine infiltration. Once a target is detected by the P-3 Orion patrol aircraft, the Wildcat AW159 helicopter pinpoints the location and eliminates the submarine with a torpedo. “I can’t help but become very emotional every time I visit a naval fleet review,” said Choi Young-sub, a retired Navy commander who attended the 1998 and 2008 international fleet reviews in South Korea. Despite the fanfare, the event was not welcomed by everyone on Jeju Island, a place the government hails as a land of peace but which is also home to a massive Navy base, established in 2016. 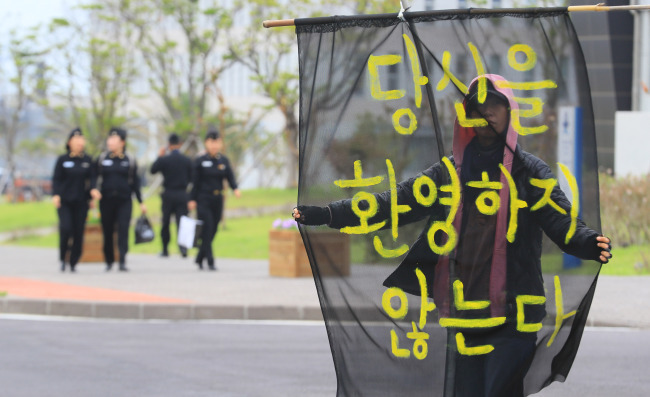 At the entrance to the Navy base where the fleet review is to be held, a group of activists and residents gathered to protest what they saw as a “militaristic event” that mars the peaceful image of Jeju Island. Some protesters held placards reading “No nuclear, but peace,” denouncing the participation of the USS Ronald Reagan, a nuclear-powered US aircraft carrier scheduled to demonstrate maritime maneuvers on Thursday along with other foreign vessels. Worsening the controversy is a diplomatic scuffle with Japan over its decision to dispatch warships flying the Rising Sun Flag to the fleet review. The flag is viewed by many South Koreans as a symbol of the repressive Japanese colonial rule. 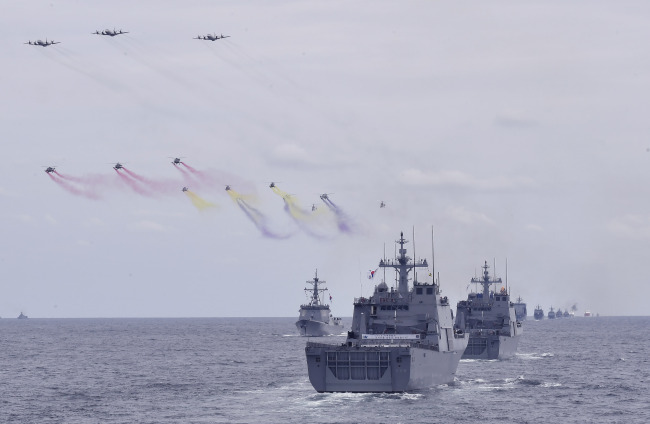 While the Japanese Maritime Self-Defense Force withdrew from the fleet review, Tokyo said it would send a group of senior naval officers to an international military conference scheduled for Friday on Jeju Island. The Chinese navy also canceled its plans to send a 7,100-ton destroyer, the Zenhgzhou, according to the South Korean Navy. The Chinese military, however, said it would proceed with its plan to send delegates to the fleet review.